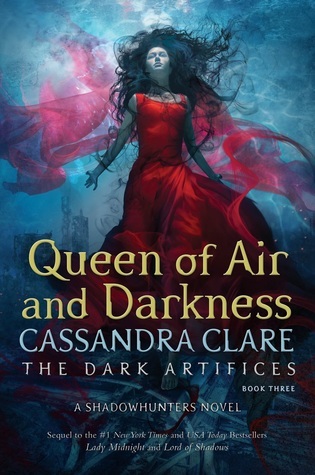 Queen of Air and Darkness takes place immediately after the tragic and shocking events that concluded Lord of Shadows. All of our favorite characters are dealing with grief in their different ways (some healthy, some less so), but their problems don’t end with the loss they just faced. The Cohort is determined to seize control, no matter what, and the Blackthorns, Emma, Christina, and Mark will have to do all they can to keep power from the hands of those who only seek to spread hatred. Cassandra Clare has slowly been increasing the size and vastness of her shadowhunter world with every book. This book introduces the world of Thule. I won’t give any spoilers, but I absolutely loved this part of the book. It adds so much weight to the events of the previous books and series and subtly calls out anyone who thought Clary was useless in The Mortal Instruments. Clare’s writing style is always easy to jump into, easy to absorb but handles the darkness of her plots and characters so well. Of course, that applies to this book as well as her previous ones. Although, she definitely has been getting better and better with each book published. This book is long. Almost 900 pages. But none of it feels unnecessary. There is constant action and adventure, and all of it is important to the plot and ultimately to the climax. I was never bored while reading. If anything, I wish it were longer, but that’s why we’re getting a spin-off series. Although I’m so bitter about the wait time. I need it now! Also, the plot and themes of this book are scarily relevant. Bigotry and hatred play a huge role in this book, with lots of political themes and plot points. So that was a not-so-fun reminder of the awfulness of the real world. It’s scary when an evil fantasy hate group reminds you of current US politics. Listen, Julian is my favorite. His development in this book? Iconic. Perfect. I love it and I love him. I was a little frustrated at the beginning with what happened to his personality, but it worked so well for the rest of the story that it was worth dealing with. Emma also has great character development in this book, and I still adore her and Julian’s relationship. The romantic side is adorable, but even just as best friends and parabatai. They work so well together, flaws and all. Speaking of adorable – Ty and Kit. Their friendship was heartbreaking and precious at the same time. I can’t wait to where their stories go in The Wicked Powers! Plus more Dru, which is always a good thing! Oh, and Cassandra Clare has officially set the standard for how all love triangles must end with this book. That’s all I’ll say about that. Cons- There are a lot of threads left loose for her next series to tie up. In 2021. That’s just cruel. Queen of Air and Darkness is amazing. It’s passionate, thrilling, hilarious, and altogether an amazing read that you will never want to end. Which is good, because its almost 900 pages.